Timing is so important! When using your ilFornino Wood Fired Pizza Oven, remember when using different toppings you might need to pre-cook an item before hand or you can put the topping on towards the end of the bake if it is something that cooks fast! Case-in-point, last week we went out to a very popular Pizzeria and I order a Shrimp and Bacon Pizza (I don't like giving any business social media negative comments,) Well it should be quite obvious that Shrimp and Raw Bacon are not going to get done at the same time. As you can see in the photo the bacon is nowhere near being done! The solutions would be to precook your own bacon or buy precooked bacon and put it on towards the end of the bake. Other items I like to precook are broccoli, spinach and I used to precook my sausage but now I am putting on dime size pinches of it. With the high heat of your Portable wood fired pizza oven the sausage cooks just fine. The End result is a much improved "wood fired pizza"
Also with timing is the conception that everything has to go on the pizza when it goes into the oven - NOT TRUE, you can bring your pizza making to another level by thinking of what you can put on your pie once it comes out of the oven. One of my favorite ingredients is Arugula which is great on a pie with prosciutto di parma. Basil another fresh herb that works great and nice freshly grated cheeses like Parmigiano-Reggiano and I always like to hit it with a touch of Sea Salt! 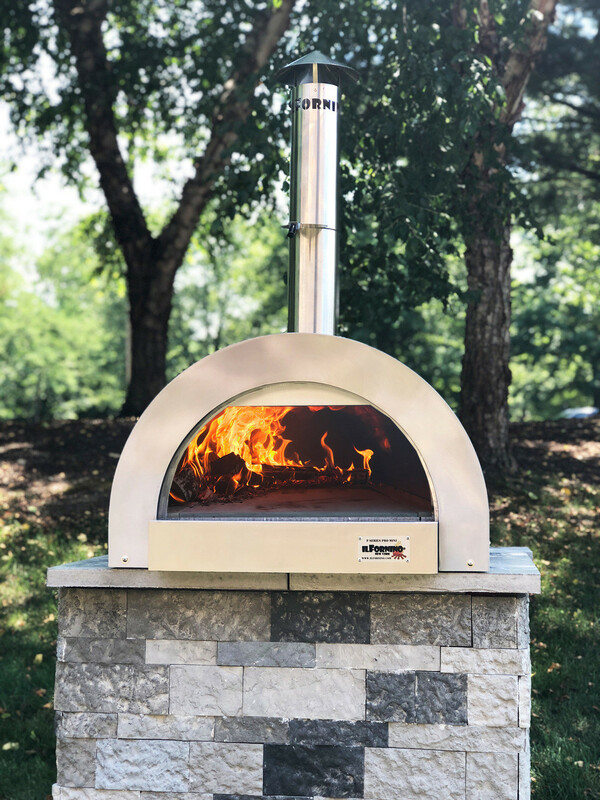 It's always a great day for Stainless Steel Wood Fired Pizza!